"I’ve never seen so many lynx ... I was gobsmacked." It might have been considered a rude awakening — that is, if the perpetrators weren't so darn adorable. Tim Newton lives in Alaska on property that borders a large nature area, so he's no stranger to seeing wildlife crossing his yard. But on this particular morning, one fluffy family of wild felines didn't just pass on through, they actually decided to borrow his porch to be their playground. This began while Newton was still asleep, though he was soon awoken by a ruckus. "It was right near dawn. I heard some noises; it was like something scrambling on the deck," Newton told The Dodo. "Coming out of my slumber, I thought, ‘What the heck is that?’ So I put on my bathrobe and slowly eased back the curtain. 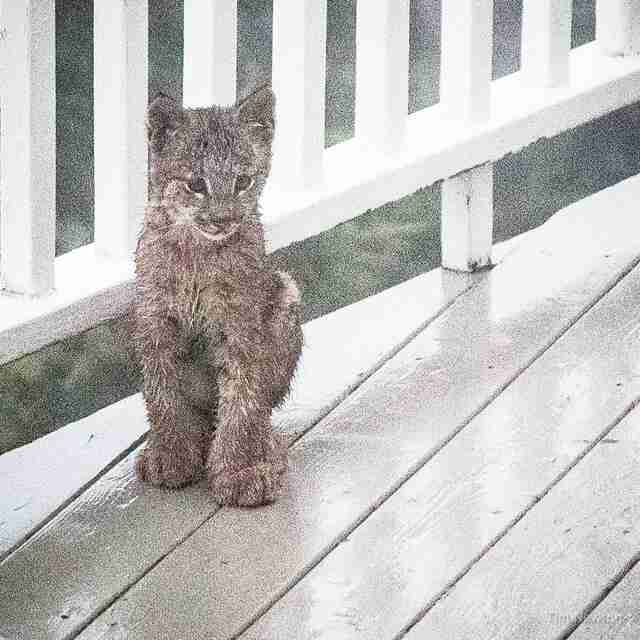 And right there, 2 feet away, was a lynx kitten. He was sitting there watching his siblings race by." 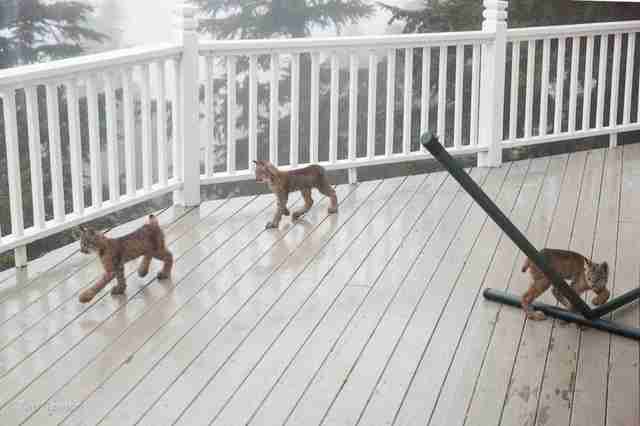 Sure enough, there were three or four lynx kittens having a party of sorts atop Newton's deck. Thankfully, he grabbed his camera. "They were running back and forth, pouncing on each other," Newton said. "I started snapping away. I thought, ‘Wow! What incredible luck. This just beats all. This is just wonderful!'" Lynx are notoriously elusive, and Newton has only spotted them a handful of times in the wild. So, to get an up-close opportunity to photograph them — from the comfort of his own home — was especially thrilling for him. "They were so cute. It was cute-tastic," Newton said. "It was amazing." 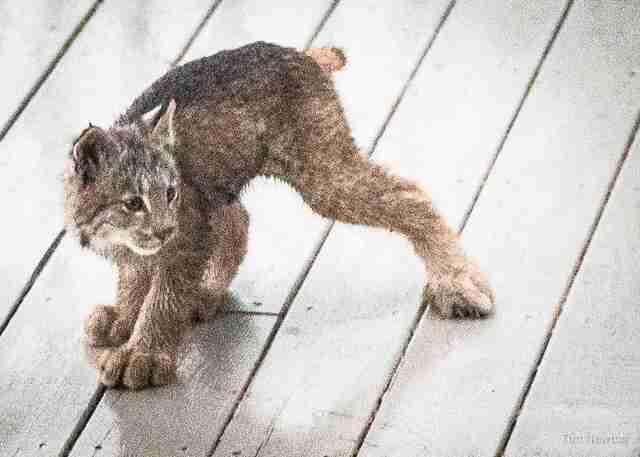 After a few minutes, the little lynx scuttled off Newton's deck and into his yard. He thought that playtime must be over — though it really had only just begun. Watching out from his screen door, Newton heard the kitten's mother mewing from the grass. Then, one by one, all seven of her kids filed back onto his deck with her following suit. 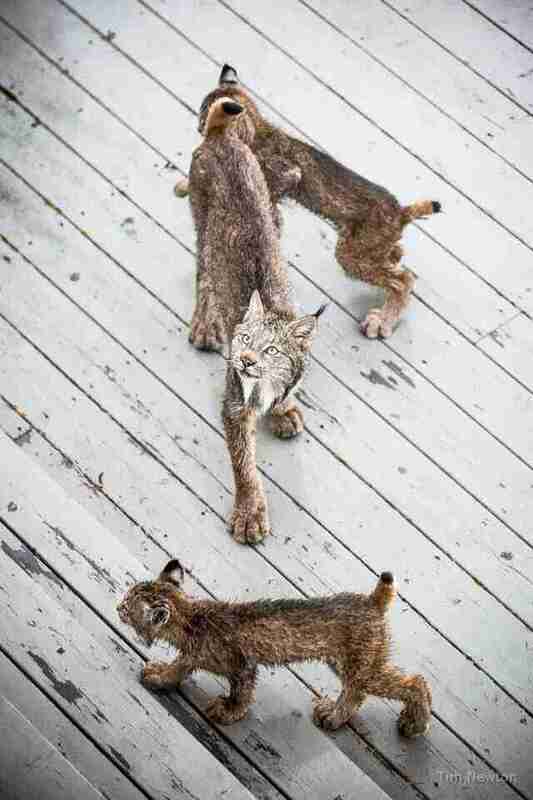 "I’ve never seen so many lynx," Newton said. 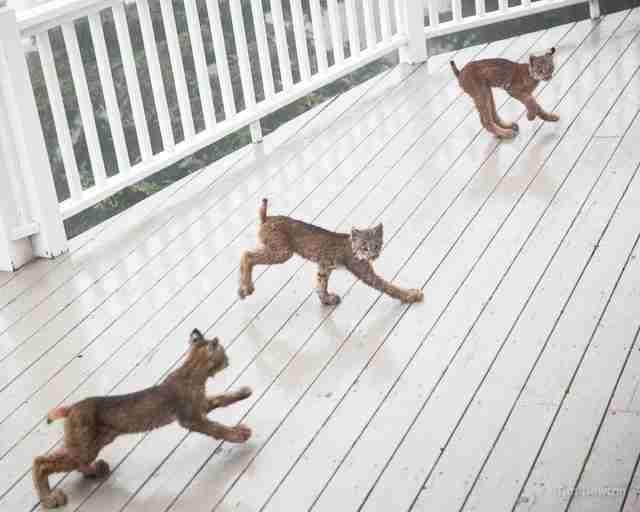 "To see all these lynx on my deck, I was gobsmacked." Obscured behind the screen, the lynx apparently didn't notice him snapping their photo. At one point, they all lingered together long enough for Newton to take a perfect family portrait. That didn't last long. Soon, the kittens were back at it. "They started to play again," Newton said. "For the next 40 minutes, they all played on my deck. They were chasing each other, rolling and wrestling." Observing just how rambunctious the kittens were, Newton gained a lot of respect for their mother. "She has her hands full," he said. 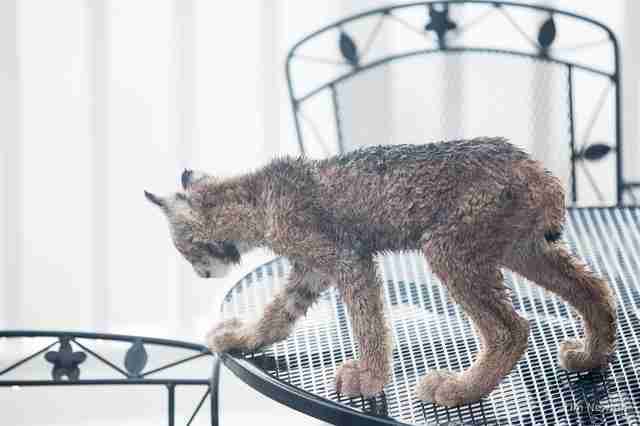 "I’ve concluded that lynx must spend 1 percent of their waking lives chasing rabbits, and 99 percent chasing their kids. What a handful!" 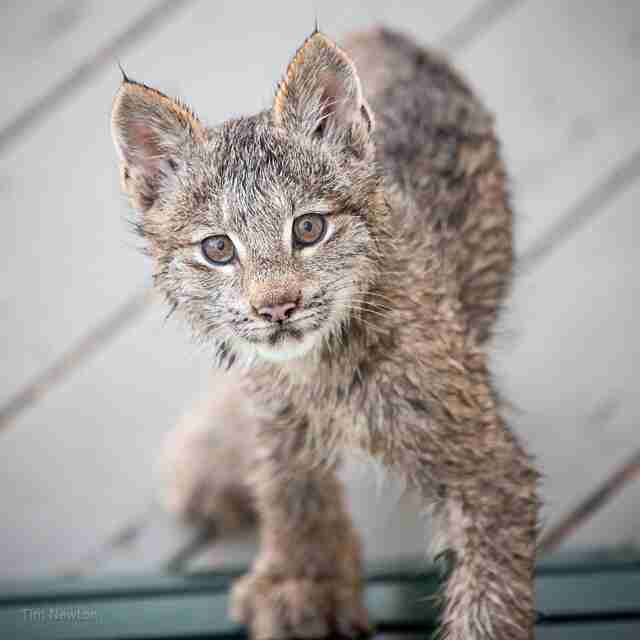 Newton captured some incredible images of the lynx, who didn't seem to notice he was even there at all — except for one, who approached the screen to investigate. That didn't go well. 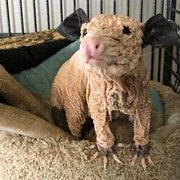 "I don’t know why I did this — maybe to say to him, ‘Oh, what a cute little kitty!’ — but I pulled the camera away from my face a little, and my eyes showed," Newton said. "The look of terror on that kitten’s face! His eyes were wide open, and he just flew away from me! But the others didn’t pick up on it." 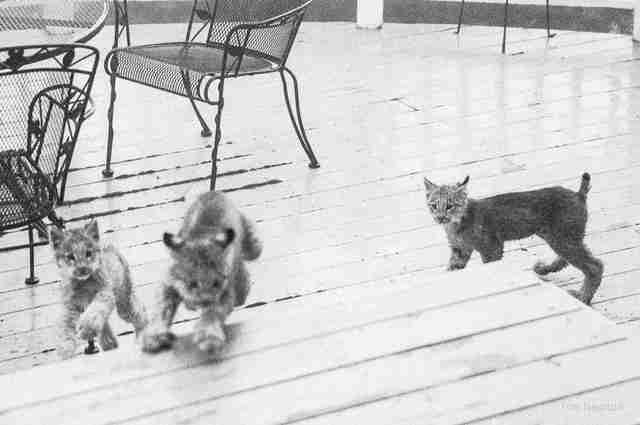 The lynx encounter concluded as delightfully as it began. Deciding that playtime was over, the mother lynx casually rounded up her kittens and they marched back into the forest together. Newton said the whole encounter felt like some sort of miracle. "We’re always thrilled to encounter wildlife," he said. "It makes me feel thankful — thankful for where I live. 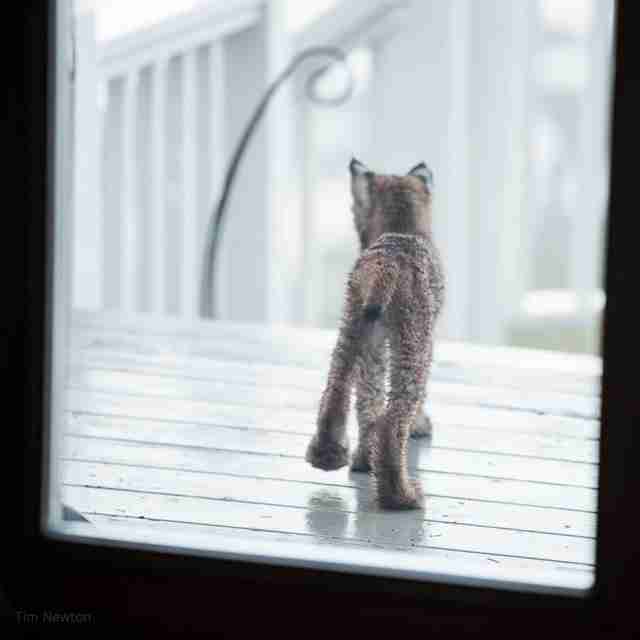 I’m thankful to have seen these lynx up close." For more information, and to keep up with Tim Newton's photography, follow him on Facebook or check out his website.